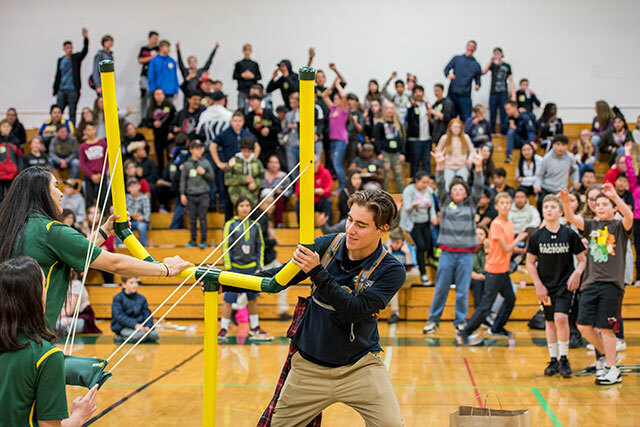 More than 350 eighth-grade students from Humboldt and Del Norte counties will get a taste of college life and its opportunities and benefits at an upcoming “I’ve Been Admitted to College” (IBAC) event at Humboldt State University. 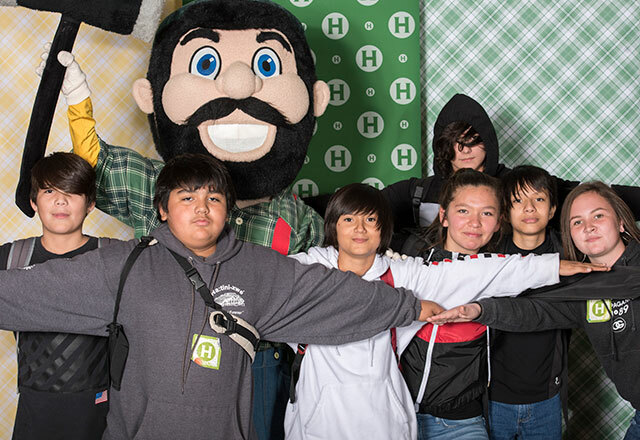 Middle school students pose at an IBAC event in fall 2018. On Friday, Feb. 1, students from Winship, Crescent Elk, and Redwood schools will spend a day on campus to learn about the college experience. HSU student ambassadors will tour them around campus, and the 8th graders will participate in hands-on, interactive experiences in the library and with athletics staff. They will also listen to a panel of students, many from the local area, as they share what they are studying and experiencing at HSU and how they overcame barriers to get to college. “This event is important because the 8th graders start seeing themselves in college,” says HSU Local Pathways Coordinator Molly Pucillo. A collaboration between the Humboldt County Office of Education and HSU’s Office of Admissions, HSU hosts multiple IBAC events each year. According to the Office of Education, 36 out of 38 Humboldt County schools that teach eighth graders will attend an IBAC at HSU this year. That’s a total of 1,337 students who will get an early introduction to college, which can stir up interest and improve their chances of being admitted. At least three Del Norte County schools will attend as well. HSU ambassadors launch t-shirts into a crowd of middle school students. There are lots of good reasons to attend college. Over a lifetime, graduates with four-year degrees earn about $1 million more than high school graduates. In tough times like 2009, during the Great Recession, the unemployment rate for high school grads reached 19.7 percent. For college grads, it was just 4.9 percent. And those who attended college are healthier and actually expected to live longer than high school graduates—about seven years on average. One teacher told Pucillo that her students couldn’t stop talking about an IBAC event they’d attended last year. For more information about “I’ve Been Admitted to College,” please contact HSU Local Pathways Coordinator Molly Pucillo at 707.826.5481 or molly.pucillo@gmail.com.